With Techstars Startup Week Tallinn a bit more than a month away, we are glad to announce the first patch of this year's events. It’s never too early to get your access to the key events during Startup Week so register early to plan your week ahead. We are really glad that for this year’s Future Founders track we will collaborate with local supporters of our future founders such as Eesti 2.0, Vivistop Telliskivi, Robotex, Insplay, Funderbeam & Superheroes. “What are startups and why are we talking about them so much lately? Can my student company also be a startup? How to find the best solutions for acquiring new skills on my own in this rapidly changing world? How to start programming studies if there are so many opportunities?” are some questions that Ede Schank Tamkivi, CEO of Eesti 2.0 raised. Answers to these questions are found at the Future Founders’ workshops and events. Soon you can register to the business plan workshop, hardware and software workshop, product presentation, and product design workshop. We’re also discussing together with established startup founders and young entrepreneurs the need for formal education in the context of starting a business. More information soon! With the aim of bringing startup world closer to all people interested, Tech Meets Tallinn track is hosting events like The Ultimate Jobbatical HQ Tour, Networking Night #25 with Gunther Pauli in Tehnopol, Twilio Estonia: A Unicorn tale with a T̷w̷i̷s̷t̷ Flex, Scoro Speed Dating and Tallinn Mobility Hack by High Mobility. Also, we are hosting a Startup Expo in Solaris Centre primarily showcasing the physical products that Estonian startups create with startups participating such as Stigo, Click & Grow, Natufia, Triumf Gamification and Sport ID. Stay tuned for more information! Startup Superpowers is a track all about spreading knowledge among our startups and startup-minded people. First events in the track are Visume - The Future of Showing Your Talent by Seeker Solutions, Big Data Business Models - Legal Challenges by Njord Law Firm, Trind.vc is welcoming startups to Mentoring sessions, Google Ads & Analytics Strategies by Holini, Intellectual Property Workshop by ClearviewIP, Anxiety-free Public Speaking by OkapiTalk, What no one tells you about growth… by Vaimo. On Techstars Thursday at Lift99, Techstars, Inventure and United Angels are inviting investment ready local startups to pitch in front of local and international investors, followed by office hours, mentor sessions, AMA and community networking in the evening. Startup Week Tallinn 2018 is also happy to announce a collaboration with Workland Vabaduse, a new co-working space in the heart of Tallinn. Workland will host some really cool events during the week, such as Kiuas Team Up Tallinn, Show Me The Money! Start-Up Funding 1.0 by Hedman and sTARTUp Talks with Fractory by sTARTUp Day. Additionally, you can find out team having late night meetings there & using it as our base camp throughout the week. A Startup Week is not worthy of its name without a good opening event and closing party. On 19 November, join us for a kick-off event at Superangel’s new hub in Telliskivi. With a good help from Superangel, tera.vc, and Funderbeam, we can’t wait to get this week started! After a week full of event-hopping, meet us back at the Superangel’s new hub on 23 November to celebrate the most promising startup scene in the world where magical creatures, founders, techies, support organisations, and our supporters come together for one more time. We promise Guud Muud only! 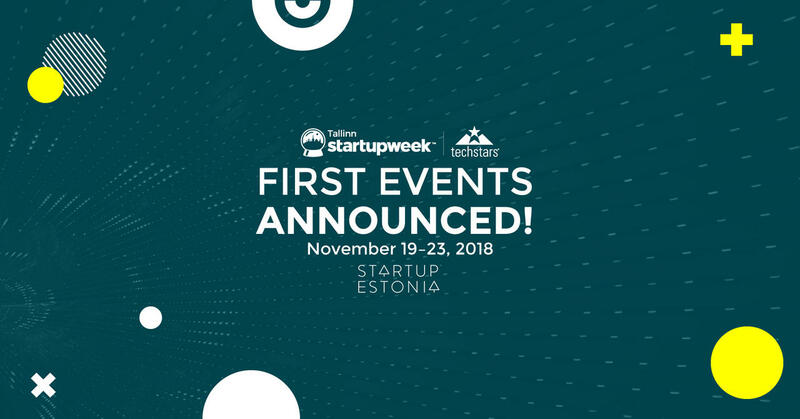 All the events of Techstars Startup Week Tallinn 2018 are free. However, to secure your spot at the event, make sure to register through Eventbrite. We will be adding new events on constantly and the total number of events in Startup Week Tallinn 2018 will be around 50. Keep an eye out on our Facebook event for updated info.